October Outfit Inspiration + Nordstrom Giftcard Giveaway! Top: Target (here, only $20! Runs a little small. I went up one size.) // Pants: Free People (here, Runs TTS. Yes, they are "cropped" but on me they fit like regular pants...#ShortGirlProbz) // Shoes: Steve Madden (here, go up 1/2 a size. They also come in blush!) 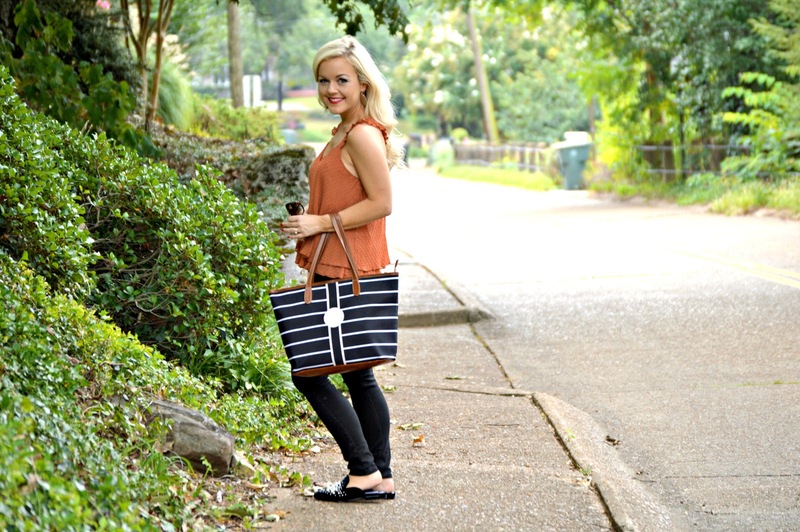 // Handbag: Brighton Gifts (here, who doesn't love a monogrammed purse!? And you can also customize the colors/pattern). I first and foremost had this post already written yesterday to post today, but I wanted to add a statement about the tragedy in Las Vegas. I try to make my blog a happy place where you can come for fashion tips but also as a little "escape" from the tragedy of this world. However, nonetheless, tragedy still seems to strike way more often than we understand. My heart is broken for the victims, their families, the first responders, the city of Las Vegas, the country music community, and the US. This is just unspeakable and I am praying so hard for everyone. Can y'all believe it's already October!? I love this month for so many reasons including but not limited to....pumpkins, pumpkin patches, pumpkin spice lattes, pumpkin flavored candles, pumpkin pie....lol do y'all see a theme!? So to celebrate the TRUE beginning of pumpkin season, I thought I would share an outfit with y'all today that is inspired by a fall color palette. This burnt orange color is absolutely perfect for fall. Moreover, this top is SO girly, which is what I love. The ruffles make a feminine statement. The swiss dot print is one of my favorites and is a subtle way to wear polka dots if you're not a big "polka dot lover" (I definitely AM a polka dot lover and love big bold prints). Not to mention it also comes in white. AND it is $20! Very reasonable. This is a perfect layering piece and can be worn under a blazer or jacket this fall. You can never have too many tops like this to be honest...there are so many ways to style them so you really get a lot of bang for your buck! Moreover, I just have to say that I have been SO happy with my Free People denim purchases I've made lately. I had never worn FP jeans before, but in the past couple of months I have bought TWO pairs. That is seriously just a testament to how comfortable they are and how much I love the fit. Also....these pearl loafer mules were one of my favorite purchases from the #NSale. As with most mules, I would recommend going up 1/2 a size. I just cannot get enough of the pearl trend (it's the southern girl in me, I guess!?). God bless y'all and God bless the US.